ICE USA 2011, the new biennial converting-industry tradeshow, premiered last week at the Orange County Convention Ctr. in Orlando, FL. All in all, it was a successful first effort for the new American edition of the ICE (Intl. Converting Exhibition) show series, organized by UK-based Mack Brooks Exhibitions. Here are a couple stats: About 265 exhibitors (many hailing from across Europe); 50,000 net sq ft of display space; 50 or so machines running on the show floor; attendees came from 32 foreign countries (primarily Canada, Mexico and Latin America) and almost all US states; and around 325 industry professionals participated in the AIMCAL-organized conference program. Total attendance figures weren’t yet available as I write this, but all of the exhibitors I spoke with were pleased with their traffic and visitor quality. We at CONVERTING QUARTERLY were certainly busy the first two days handing out copies of our premiere issue and signing up new subscribers. 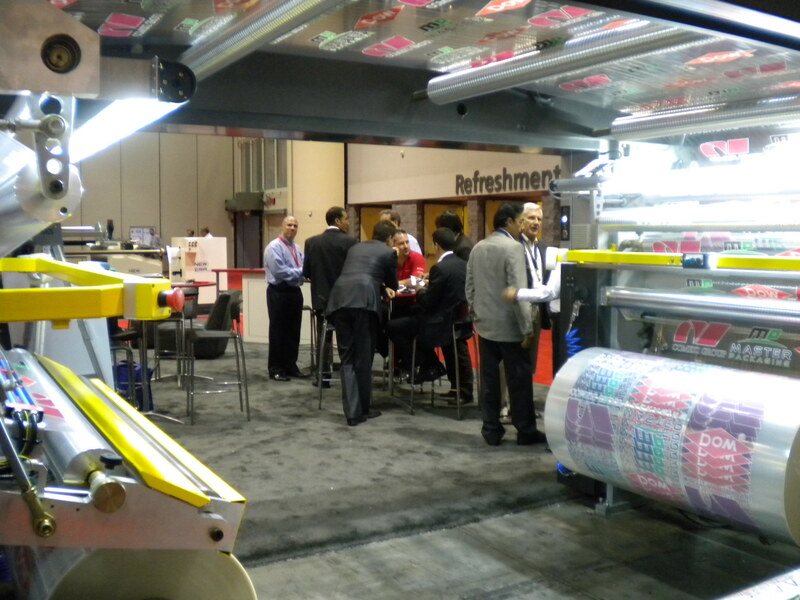 Coating/laminating and slitting/rewinding are clearly hallmarks of ICE events, and ICE USA 2011 was no exception. The exhibitor core of 40 such companies were augmented by another 150 or so providers of material substrates, consumables, equipment components and accessories. And the snazzy look and feel of the AIMCAL Pavilion, with a near-record number of 23 participants, will forever be hard to beat. 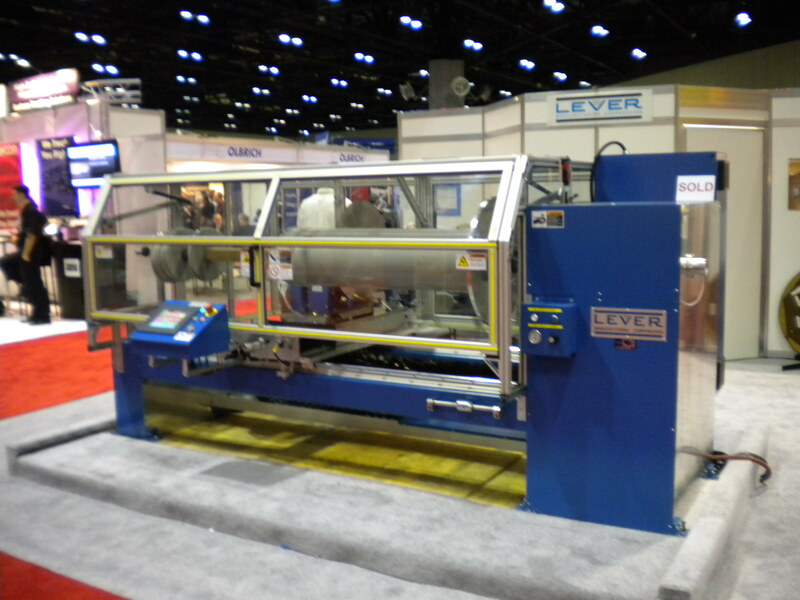 The Comexi Nexus EVO solventless laminator was demonstrated twice daily to large crowds at ICE USA 2011. 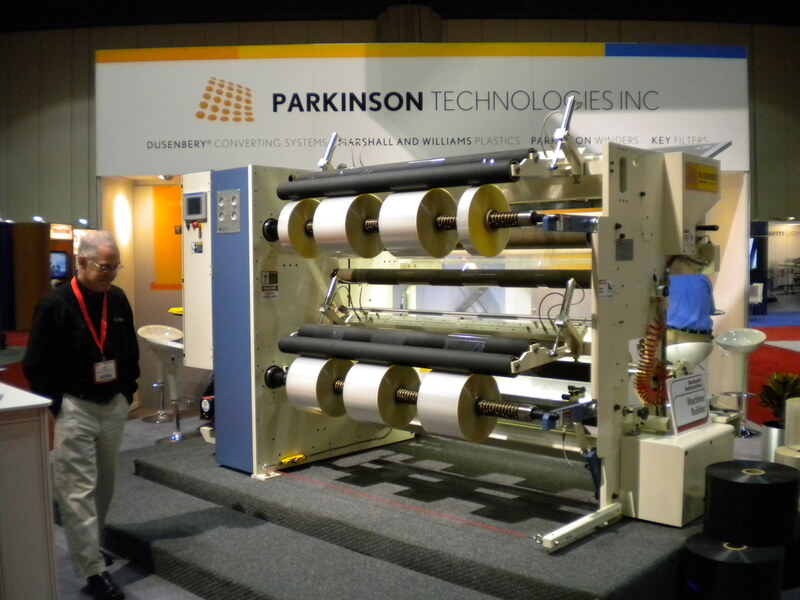 The Dusenbery Genesis 700 duplex slitter/rewinder at the Parkinson Technologies booth at ICE USA 2011. 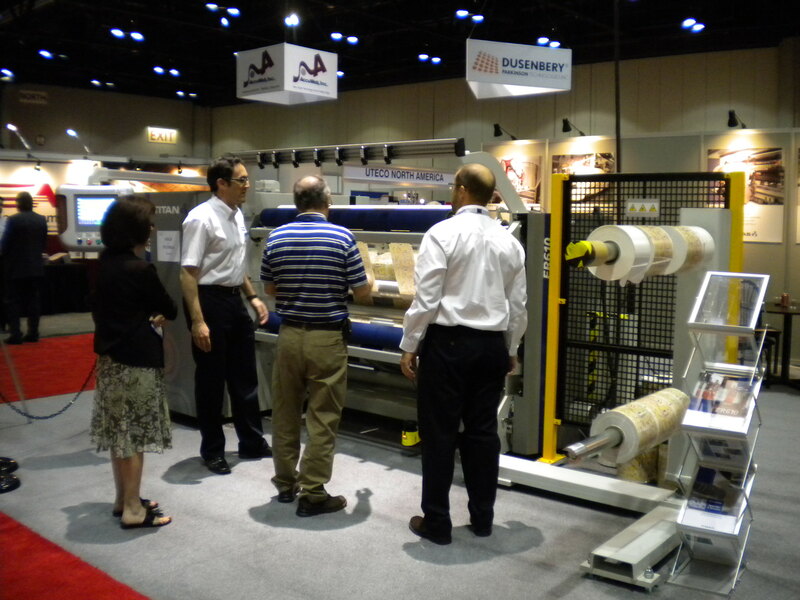 Customers look over the Atlas Titan ER610 compact slitter/rewinder. The floor model was sold to Plasticos Especializados de Monterrey in Mexico. The Lever Mfg. 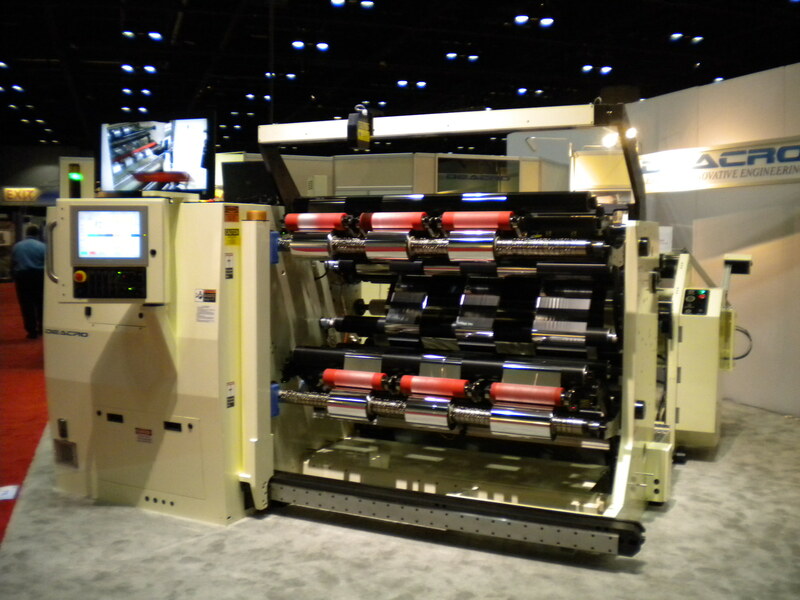 LS-7000 automatic slitter runs foams, tapes, gaskets and other roll goods up to 23 in. in diameter. 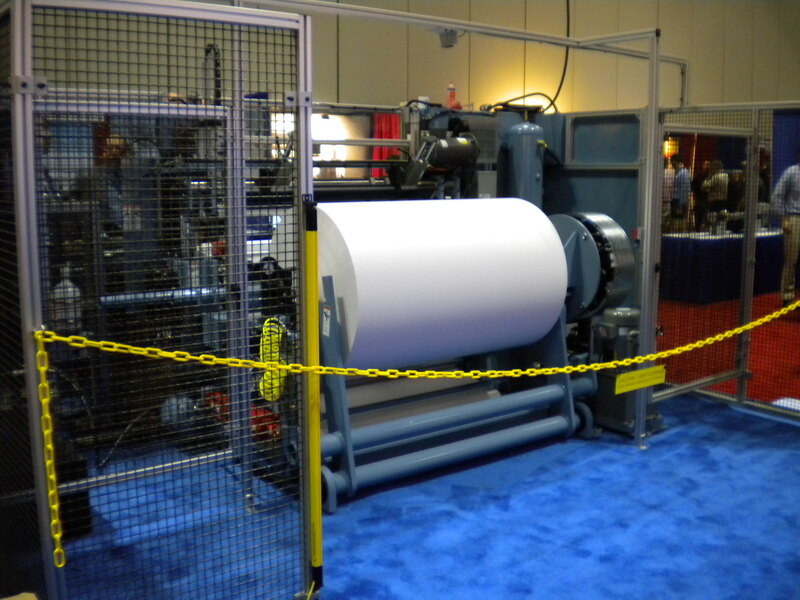 The Jennerjahn Machine utility slitter/rewinder provides cost-efficient paper converting. Canada's Deacro also showed its slitting prowess at ICE USA. 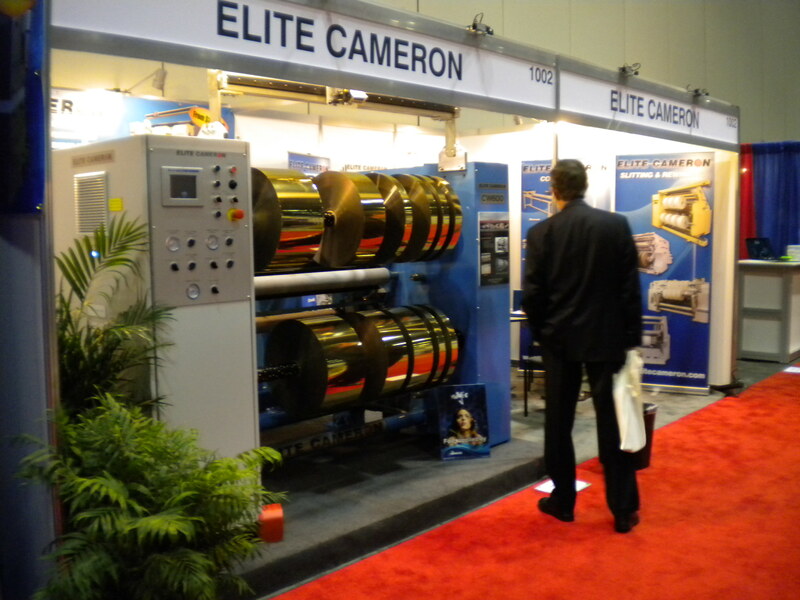 UK-based supplier Elite Cameron displayed a low-cost slitter/rewinder. This entry was posted in coating/laminating, flexible packaging, labels, slitting/rewinding and tagged converting, flexible packaging, ICE USA, labels, packaging, paper, plastic film, tissue/towel. Bookmark the permalink.